Michael Dunlop on the Hawk Racing BMW at the North West 200 on Tuesday. Michael Dunlop has set the pace in the opening Superbike practice session at the Vauxhall International North West 200. In glorious conditions, Dunlop left it late to knock 15-time winner Alastair Seeley off the top spot at the Triangle course, lapping at 121.653mph to head the times by almost six tenths of a second on the Hawk Racing BMW. Carrick rider Seeley (Briggs BMW) clocked 121.386mph in second place as he begins his quest to become the most successful rider ever at the event this week, when one more win will put him ahead of road racing legend Robert Dunlop on the roll of honour. Tyco BMW’s Ian Hutchinson – who went through the speed trap at 203mph – was third fastest on the S1000RR, one second down on Dunlop, with Honda Racing’s John McGuinness next (120.231mph), 3.1 seconds off the leader. Veteran and 13-time winner Michael Rutter impressed in fifth place on the SMT Bathams BMW with a lap of 119.860mph, while James Hillier completed the top six on the Quattro Plant Muc-Off Kawasaki. 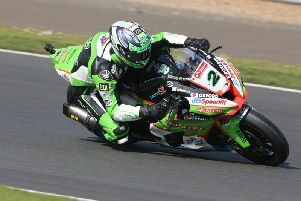 British Superbike star Peter Hickman was seventh fastest on the JG Speedfit Kawasaki as he makes only his second appearance at the North West, while Manx rider Conor Cummins (Honda Racing) was solid in eighth place. The top ten was completed by Bruce Anstey on the Valvoline Padgetts Honda and Lee Johnston (East Coast/Burdens BMW). Jeremy McWilliams, who was riding the Mar-Train Yamaha R1 on the roads for the first time, was 11th fastest. The 52-year-old is standing in for Dan Kneen, who was ruled out of the North West with a broken arm following a training accident on his bicycle. Ryan Farquhar, making his roads debut on the second of the Tyco BMW machines, was 15th quickest, one place behind William Dunlop on the MSS Kawasaki Superstock machine. Earlier, Seeley was quickest in the Supersport session on the Gearlink Kawasaki, lapping at 116.412mph to go 3.8 seconds clear of Hutchinson on the CAME BPT Yamaha. Martin Jessopp was third fastest, nine tenths behind Hutchinson, with Johnston on the East Coast Triumph, John McGuinness (Jackson Honda) and Dean Harrison on the Silicone Engineering Kawasaki rounding out the first half dozen. Michael Dunlop was seventh fastest on his MD Racing Yamaha ahead of Anstey and William Dunlop – also Yamaha-mounted – who is running his own team with backing from IC Racing and MMB. James Hiller completed the top ten on the Quattro Plant Muc-Off Kawasaki.